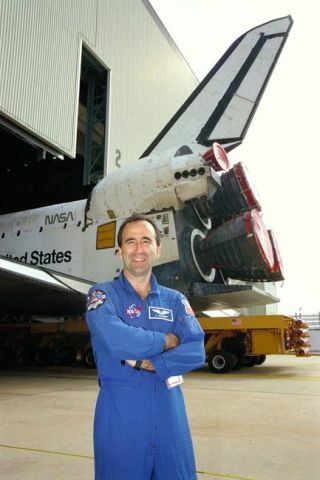 NASA astronaut Frank Caldeiro poses in front of space shuttle Discovery in 1998. Fernando"Frank" Caldeiro, a NASA astronaut and the first person ofArgentinean descent to train for a spaceflight, died on Saturday after a twoand a half year battle with brain cancer. He was 51. First hired by NASA in 1991 as an expert in cryogenics and propulsion systemsfor the Kennedy Space Center's safety and mission assurance office in Florida,he took part in 52 space shuttle launches before being chosen asan astronaut candidate in 1996. As a member of NASA's 16th class of "ascans," dubbed "TheSardines" because at 44 candidates they were the largest group ofastronauts to be chosen to date, Caldeiro went through basic training alongsidePeggy Whitson, the current chief of the Astronaut Office, and Jeff Williams,who arrived aboard the International Space Station (ISS) last week, among manyothers. Caldeiro however, would never be assignedto a mission. In 2006, he told the Orlando Sentinel newspaper, "Flying in space, to me,has become more like, well, you know, you can't chase something so much thatyou run it over. You can be obsessed by it and be miserable or you can say,'Well, this is an opportunity; I'm first in line in front of 350-million otherpeople.'" Embracing a career with NASA that followed the latter path, Caldeiro served intechnical support roles, first as the lead astronaut for the station's lifesupport systems and its European-built components, reviewing the design andmanufacture of the U.S. "Harmony" Node 2 and European Space Agency(ESA) Columbus modules, as well as the yet-to-be-launched Cupola roboticsviewing port and the space shuttle-lofted cargo carriers, the Multi PurposeLogistics Modules (MPLM). From June 2005 to December 2006, Caldeiro served as the lead astronaut incharge of shuttle software testing at the Johnson Space Center's ShuttleAvionics Integration Laboratory, testing in-flight maintenance procedures,prior to being reassigned to Houston's nearby Ellington Field to direct thehigh-altitude atmospheric research experiment program carried onboard NASA'sWB-57 aircraft. He was still serving in that role when he passed away. "Frank was a valued member of the astronaut corps and the Flight CrewOperations team," said fellow astronaut Brent Jett, the director of NASA'sFlight Crew Operations. "He provided a wealth of experience and madesignificant contributions to the success of both the WB-57 project and thespace shuttle program. He will be missed by all those who knew him at NASA. Ourhearts go out to his family." Born June12, 1958, in Buenos Aires, Argentina, Caldeiro immigrated to the United Statesat age 16 not speaking a word of English. First settling in Flushing, New York,he went on to earn an associate degree in applied science in aerospacetechnology from the State University of New York at Farmingdale, followed by abachelor of science degree in mechanical engineering from the University ofArizona in 1978 and 1984 respectively. Eleven years later, he completed his master of science degree in engineeringmanagement from the University of Central Florida. Before working for NASA, Caldeiro was hired by Rockwell International, workingon the checkout and delivery of all 100 B-1B Bombers to the U.S. Air Force. In1988, he reported to Kennedy Space Center as a Rockwell space shuttle mainpropulsion system specialist responsible for the ground processing and launchof shuttle Discovery. In 2002, he was named National Hispanic Scientist of the Year by the Museum ofScience and Industry in Tampa, Florida. That same year, he was appointed byPresident George W. Bush to serve on the Advisory Commission on EducationalExcellence for Hispanic Americans under the "No Child Left Behind"Act. A member of the Experimental Aircraft Association and the Aircraft Owners andPilots Association, Caldeiro was known to enjoy flying and racing his own RutanLong Ez experimental aircraft, in which he logged over 500 hours. He is survived by his wife, the former Donna Marie Emero of Huntington Beach,California, and two daughters, Annie and Michelle. Copyright 2009 collectSPACE.com. All rights reserved.